Malaria has been a major driving force in the evolution of the human genome. In sub-Saharan African populations, two neighbouring polymorphisms in the Complement Receptor One (CR1) gene, named Sl2 and McCb, occur at high frequencies, consistent with selection by malaria. Previous studies have been inconclusive. Using a large case-control study of severe malaria in Kenyan children and statistical models adjusted for confounders, we estimate the relationship between Sl2 and McCb and malaria phenotypes, and find they have opposing associations. The Sl2 polymorphism is associated with markedly reduced odds of cerebral malaria and death, while the McCb polymorphism is associated with increased odds of cerebral malaria. We also identify an apparent interaction between Sl2 and α+thalassaemia, with the protective association of Sl2 greatest in children with normal α-globin. The complex relationship between these three mutations may explain previous conflicting findings, highlighting the importance of considering genetic interactions in disease-association studies. Malaria kills more than half a million children in Africa every year. The disease is caused by the Plasmodium falciparum parasite, and mosquitos infected with the parasites spread them to humans when they bite. Once inside a human, the parasites infect the red blood cells. In severe cases, these red blood cells can stick to the walls of small blood vessels that supply the brain and so hinder the flow of oxygen, causing a coma. This is called cerebral malaria. Malaria can also result in the destruction of many oxygen-carrying red blood cells, which causes severe anemia. Both cerebral malaria and severe anemia can lead to death. Small changes (called mutations) in certain human genes can protect against malaria. Over time, mutations that protect people living in Africa from dying from malaria have been passed down through generations. A good example is the sickle cell mutation, which causes red blood cells to be of an unusual shape, but also affects the ability of malaria parasites to grow normally within red cells. Finding new mutations that protect against malaria may help scientists understand how severe malaria happens and eventually develop new drugs and vaccines against the disease. Some studies have found that mutations in a gene called complement receptor 1 (CR1) may be protective, although others have disagreed. Now, Opi, Swann et al. show that children with one of the CR1 mutations were one-third less likely to get cerebral malaria and half as likely to die as children without the mutation. In the study, genetic and health information on more than 5,500 children in Kenya were analyzed to see if the severity of malaria differed depending on whether they had a CR1 mutation. They also found that the CR1 mutation is only protective against severe malaria when the child does not have another malaria- protective mutation called α-thalassemia. In children with α-thalassemia, the CR1 mutation does not make a difference. The interaction between the CR1 mutation and α-thalassemia may explain why some studies did not show a benefit of CR1. If the researchers did not include α-thalassemia in their assessment, they could not have seen the whole picture. Future studies showing how the CR1 mutation protects against cerebral malaria could help identify new treatments that prevent severe disease or death. More study of interactions between genes that play a role in malaria may also be helpful. Complement Receptor One (CR1) plays a key role in the control of complement activation and the immune clearance of C3b/C4b-coated immune complexes (Krych-Goldberg and Atkinson, 2001). CR1 is expressed on a range of cells including red blood cells (RBCs), leucocytes and glomerular podocytes (Krych-Goldberg and Atkinson, 2001). A number of CR1 polymorphisms have been described, including four molecular weight variants and variation in the number of CR1 molecules expressed on the surface of RBCs (reviewed by [Krych-Goldberg et al., 2002; Schmidt et al., 2015]). Missense mutations of CR1 form the basis of the Knops blood group system of antigens, that includes the antithetical antigen pairs of Swain-Langley 1 and 2 (Sl1 and Sl2) and McCoy a and b (McCa and McCb) (Moulds, 2010). The non-synonymous single nucleotide polymorphisms (SNPs) A4828G (rs17047661) and A4795G (rs17047660) within exon 29 of the CR1 gene give rise to the Sl1/Sl2 and McCa/McCb alleles, encoding R1601G and K1590E, respectively (Moulds et al., 2001) (Figure 1). Diagram of the most common Complement Receptor 1 size variant (CR1*1). Adapted from Schmidt et al. (2015) and Krych-Goldberg et al. (2002). The ectodomain of CR1 is composed of 30 Complement Control Protein (CCP) domains which are organized into four ‘Long Homologous Repeats’ (LHR). The single-nucleotide polymorphisms determining the Sl and McC antigens of the Knops blood group system are found in CCP 25 in LHR-D (red). Various functions have been mapped to different regions of CR1, including Site 1 (decay accelerating activity for C3 convertases; binding of the complement component C4b and the P. falciparum invasion ligand PfRH4), and Site 2 (cofactor activity for Factor I; binding of C3b and C4b and P. falciparum rosetting). LHR-D is thought to bind C1q and Mannose Binding lectin (MBL), but the specific binding sites have not been mapped. TM, transmembrane region; CYT, cytoplasmic tail. CR1 has been implicated in the pathogenesis of multiple diseases, with epidemiological and in vitro data suggesting a role in malaria (Schmidt et al., 2015). The Sl2 and McCb alleles occur at high frequencies only in populations of African origin (Figure 2) (Thathy et al., 2005; Zimmerman et al., 2003; Moulds et al., 2004; Noumsi et al., 2011; Fitness et al., 2004; Covas et al., 2007; Gandhi et al., 2009; Yoon et al., 2013; Hansson et al., 2013; Kariuki et al., 2013; Eid et al., 2010), which, given the historical prevalence of the malaria-causing parasite Plasmodium falciparum in sub-Saharan Africa, might suggest a possible survival advantage against malaria (Rowe et al., 1997; Rowe et al., 2000). CR1 is a receptor for the invasion of RBCs by Plasmodium falciparum merozoites (Spadafora et al., 2010; Tham et al., 2010) and for the formation of clusters of P. falciparum-infected RBCs (iRBCs) and uninfected RBCs, known as rosettes (Rowe et al., 1997). The rosetting phenotype is associated with severe malaria in sub-Saharan Africa (Doumbo et al., 2009), with pathological effects likely due to the obstruction of microcirculatory blood flow (Kaul et al., 1991). RBCs from donors with the high-frequency African CR1 Knops mutations bind poorly to the parasite ligand P. falciparum erythrocyte membrane protein-1 (PfEMP1) that mediates rosetting by iRBCs, potentially protecting against severe malaria by reducing rosetting (Rowe et al., 1997). Nevertheless, epidemiological data supporting this possibility are contradictory, with some studies showing an association between Sl and McC genotypes and severe malaria (Thathy et al., 2005; Kariuki et al., 2013; Tettey et al., 2015) and others finding none (Zimmerman et al., 2003; Hansson et al., 2013; Jallow et al., 2009; Manjurano et al., 2012; Toure et al., 2012; Rockett et al., 2014). Some previous studies have not considered Sl and McC genotypes together in the same statistical model, despite their physical adjacency in the CR1 molecule, nor taken into account potential interactions with other malaria resistance genes. Given the important biological role of CR1 in malaria host-parasite interactions, we aimed to clarify the relationship between the Sl and McC alleles and severe malaria in a case-control study of Kenyan children. These investigations were supplemented with a separate longitudinal cohort study of Kenyan children, examining the associations of these alleles with uncomplicated malaria and other common childhood illnesses. Finally, we also investigated the influence of these alleles on the formation of P. falciparum rosettes, as a potential functional explanation for these results through ex vivo laboratory studies. (A) Shows the global frequencies of the Sl alleles. Sl1 is represented in blue and Sl2 in red. (B) Shows the global frequencies of the McC alleles. McCa is represented in green and McCb in purple. The two samples in North and South America showing high frequencies of Sl2 and McCb alleles are both derived from populations with African heritage. Numbers in parentheses indicate the studies from which the Sl and McC allele frequencies were derived, with * indicating data derived from this study. Thathy et al., 2005;  Zimmerman et al., 2003;  Moulds et al., 2004;  Noumsi et al., 2011;  Fitness et al., 2004;  Covas et al., 2007;  Gandhi et al., 2009;  Yoon et al., 2013;  Hansson et al., 2013;  Kariuki et al., 2013;  Eid et al., 2010. Data were obtained from 5545 children enrolled in a case-control study of severe malaria (Figure 3). The general characteristics of the cases and controls are shown in Supplementary file 1A, and the characteristics of the dataset by Sl and McC genotype are shown in Supplementary file 1B. The Sl2 and McCb allele frequencies (0.68 and 0.16 respectively) were comparable to other African populations (Figure 2). There was no significant deviation from Hardy-Weinberg equilibrium for the Sl or McC genotypes among controls (Supplementary file 1C). Patient inclusion flow chart for the Kenyan case-control study. Using a simple logistic regression model containing only Sl and McC genotypes (referred to as the unadjusted analysis below), we found a non-significant association between the Sl2 allele and severe malaria overall, with the Sl2/Sl2 genotype being associated with an OR for severe malaria of 0.90 (95% CI 0.79–1.01; p=0.07) (Supplementary file 1D). We attempted to refine this signal by fitting a more complete model to the data, including the potential confounding factors of ethnicity, location, sickle cell trait, ABO blood group and α+thalassaemia genotype, as well as considering possible first-order interactions between terms (referred to as the full adjusted analysis below). A significant protective association was observed for Sl2 in the recessive form (adjusted Odds Ratio (aOR) 0.78; 95% CI 0.64–0.95; p=0.011), which was most marked for cerebral malaria (aOR 0.67; 0.52–0.87; p=0.006) (Figure 4 and Table 1). The Sl2/Sl2 genotype was also associated with significant protection against death from severe malaria (aOR 0.50; 0.30–0.80; p=0.002), and death among children admitted with a specific diagnosis of cerebral malaria in the full adjusted analysis (aOR 0.44; 0.23–0.78; p=0.007) (Figure 4 and Table 1). Unexpectedly, we observed a significant interaction between Sl2 and α+thalassaemia genotype, such that the protective associations of Sl2 were only seen in individuals of normal α-globin genotype (Figure 5). We found no evidence for an association between Sl2 and any other clinical form of severe malaria (Table 1), or with P. falciparum parasite density (Figure 6). The Sl2 and McCb alleles have opposing associations with cerebral malaria (CM) and death. Forest plot showing the associations between Sl and McC polymorphisms and severe malaria in Kilifi, Kenya. Filled boxes: adjusted Odds Ratios (aOR) for the Sl2 genotype in the recessive form (i.e. Sl2/Sl2 vs all other Sl genotypes). Open boxes: McCb in the additive form (i.e. change in odds ratio with each additional McCb allele). Sl and McC genotype were included together in a statistical model to examine their associations with malaria susceptibility. aORs displayed are adjusted for ethnicity, location of residence, sickle cell genotype, α+thalassaemia genotype and ABO blood group. An interaction term between Sl genotype and α+thalassaemia is included in the model. Model outputs following 2000 bootstrapped iterations are shown. The protective association of Sl2 with cerebral malaria and death is only evident in children with normal α-globin. Interaction plots showing the interaction between Sl (recessive) and α+thalassaemia for the proportion of children suffering (A) cerebral malaria and (B) death. For α+thalassaemia status, 0 = wild type α-globin; 1 = heterozygote or homozygote for α+thalassaemia. For Sl (recessive) status, 0 = Sl1/Sl1 or Sl1/Sl2 genotype; 1 = Sl2/Sl2 genotype. Parasite densities by Sl and McC genotypes. Geometric mean parasite densities in the Kenyan case-control study (severe malaria) and longitudinal disease cohort study (uncomplicated malaria and asymptomatic parasitaemia) by A) Sl genotypes and B) McC genotypes. The data on severe malaria includes 1695 children: (Sl1/Sl1 (175), Sl1/Sl2 (793), Sl2/Sl2 (727) and McCa/McCa (1167), McCa/McCb (478) and McCb/McCb (50). The data on uncomplicated malaria includes 162 children: (Sl1/Sl1 (16) , Sl1/Sl2 (75), Sl2/Sl2 (71) contributing 124, 488 and 461 episodes respectively and McCa/McCa (107), McCa/McCb (49) and McCb/McCb (6) contributing 699, 349 and 25 episodes, respectively. The data on asymptomatic parasitaemia includes 57 children: (Sl1/Sl1 (5), Sl1/Sl2 (26), Sl2/Sl2 (26) contributing 6, 35 and 35 episodes, respectively, and McCa/McCa (34), McCa/McCb (20) and McCb/McCb (3) contributing 47, 25 and 4 episodes, respectively. Differences in parasite densities by genotype were tested by linear regression analysis with adjustment for HbAS, age as a continuous variable and ABO blood group in the severe malaria cases, HbAS and season (defined into 3-monthly blocks) in the uncomplicated malaria samples and HbAS and ABO blood group in the asymptomatic parasitaemia samples. Data were adjusted for within-person-clustering of events in the uncomplicated malaria and asymptomatic parasitaemia studies. Bars represent 95% confidence intervals. Adjusted Odds Ratios (aOR) for severe malaria by Sl2 (recessive) and McCb (additive) genotype in Kenya. *Adjusted Odds Ratios (aOR) and 95% Confidence Intervals (CI) are presented for the Sl2 genotype in the recessive form (i.e. Sl2/Sl2 vs all other Sl genotypes) and McCb genotype in the additive form (i.e. change in aOR with each additional McCb allele). Sl and McC genotype were included together in a statistical model to examine their associations with malaria susceptibility. aORs displayed are adjusted for ethnicity, location of residence, sickle cell genotype, α+thalassaemia genotype and ABO blood group. An interaction term between Sl genotype and α+thalassaemia was included in the model. Model outputs following 2000 bootstrapped iterations are shown. †99 children (7 of whom died) were severe malaria cases whose CM status was not recorded, hence these children are included in the numbers for ‘All severe malaria’ and ‘Died’ but not in ‘with CM’ or ‘without CM’ categories. ‡Models that showed significant evidence of interaction between Sl2 and α+thalassaemia. §CM, cerebral malaria (P. falciparum infection with a Blantyre coma score of < 3). #SMA, severe malarial anaemia (P. falciparum infection with Hb < 5 g/dl). ¶34/56 cases who died with SMA also had CM. **RD, respiratory distress (P. falciparum infection with abnormally deep breathing). ††56/73 cases who died with RD also had CM. The unadjusted analysis showed a borderline significant association between McCb and increased susceptibility to severe malaria overall (OR 1.17; 1.00–1.25; p=0.056, Supplementary file 1D), and significant associations with increased risk of cerebral malaria (OR 1.21; 1.05–1.39; p=0.008) and death (OR 1.34; 1.00–1.77; p=0.046, Supplementary file 1D). Similar associations were seen in the full adjusted analysis, although this only reached statistical significance for cerebral malaria (aOR 1.19; 1.10–1.38; p=0.025 (additive model), Figure 4 and Table 1). We found no association between McCb and any other clinical form of severe malaria (Table 1 and Supplementary file 1D) or with P. falciparum parasite density (Figure 6). We considered whether the observed results for Sl and McC could be consistent with the effect of a single haplotype spanning Sl and McC, or with the effect of a specific genotype combination. Sl and McC are 33 bp apart and are in linkage disequilibrium, with only three of four possible haplotypes observed in our data. We therefore reanalyzed the data under a haplotype model in which the per-individual count of each of the three observed haplotypes was included as a predictor along with the potential confounding factors, as well as under a genotypic model in which the count of each of the six possible Sl/McC genotype combinations was included as a predictor (Appendix 2). These analyses suggest an additive protective association with the Sl2/McCa haplotype (aOR = 0.85; 0.75–0.96; p=0.007), with broadly consistent results observed for analysis of genotype combinations (Supplementary file 1E and 1F). Thus, the opposing effects of Sl2 and McCb observed above could plausibly result from the protective association of a single haplotype at the locus, although this is difficult to distinguish from the individuals SNPs acting independently and additively based on the statistical evidence alone. We next examined the association between Sl2 and McCb alleles and uncomplicated malaria in a longitudinal prospective study of 208 Kenyan children. General characteristics of the cohort study population by Sl and McC genotypes are shown in Supplementary file 1G. After adjusting for variables known to influence malaria susceptibility, the Sl2 allele was associated with a >50% reduction in the incidence of uncomplicated malaria (additive model) (Table 2; the number of episodes, incidence and unadjusted Incidence Rate Ratios for the diseases studied in the longitudinal cohort are shown in Supplementary file 1H, I and J). Once again, a significant interaction was seen with α+thalassaemia, such that the protective association of Sl2 was only demonstrated in children of normal α-globin genotype (Table 3). We found no significant association between the McCb allele and uncomplicated malaria (Table 2). Adjusted Incidence Rate Ratios (aIRR) for uncomplicated malaria and non-malarial diseases in Kenya by Sl and McC genotype*. *Data were collected from 22 Sl1/Sl1, 94 Sl1/Sl2 and 92 Sl2/Sl2 individuals during 49.4, 213.8 and 188.8 cyfu (child-years of follow-up), respectively, and 137 McCa/McCa, 63 McCa/McCb and 8 McCb/McCb individuals during 294.5, 143.2 and 14.3 cyfu, respectively. Both Sl2 and McCb alleles were tested for their association with the disease outcomes of interest using Poisson regression in the 1recessive, 2dominant, 3heterozygous and 4additive models. The best fitting models as examined using the Akaike information criterion (AIC) were used in the final analysis that included adjustment for McC genotype (for Sl analyses), Sl genotype (for McC analyses) α+thalassaemia and sickle cell genotype, ABO blood group, season (divided into 3 monthly blocks), ethnicity, age as a continuous variable and within-person clustering of events. †aIRRs: adjusted Incidence Rate Ratios. ‡Models that showed significant evidence of interaction between either Sl2 or McCb and α+thalassaemia. §LRTI: Lower Respiratory Tract Infection. #URTI: Upper Respiratory Tract Infection. Incidence of uncomplicated malaria by Sl genotype and α+thalassaemia status in the Kenyan longitudinal cohort study. Incidence = number of episodes per child-year of follow up (cyfu). Data were collected from 22 Sl1/Sl1, 94 Sl1/Sl2 and 92 Sl2/Sl2 individuals during 49.4, 213.8 and 188.8 child-years of follow-up, respectively. The data shown above are incompatible with malaria being the selective pressure for McCb in the Kenyan population, and suggest that other life-threatening childhood diseases may have been responsible for selection of McCb. We therefore used the same longitudinal cohort study to investigate whether the McCb and Sl2 alleles influence the risk of other childhood diseases. McCb was associated with borderline significant protection against several common infectious diseases including LRTIs, URTIs and gastroenteritis (Table 2). Sl2 was associated with a borderline reduced incidence of gastroenteritis (Table 2). The association of McCb with gastroenteritis was predominantly seen in children of normal α-globin genotype, echoing the interaction seen with Sl2 and malaria. A previous in vitro study based on a culture-adapted P. falciparum parasite line suggested that RBC from Sl2 genotype donors had a reduced ability to form rosettes, providing a possible mechanism for protection against severe malaria (Rowe et al., 1997). P. falciparum clinical isolates were not available from the Kenyan case-control study to investigate this potential mechanism in that population. However, the association of Sl and McC genotypes with ex vivo P. falciparum rosette frequency could be examined using 167 parasite isolates from a case-control study of children with clinical malaria in Mali (Doumbo et al., 2009). Analysis of this small case-control study suggested a protective association between the Sl2/Sl2 genotype and cerebral malaria (aOR 0.35, 95% CI 0.12–0.89, p=0.024) and the Sl2/Sl2-McCa/McCa genotype combination was associated with protection against cerebral malaria (aOR 0.14, 95% CI 0.02–0.84, p=0.031, Appendix 1). As such, we considered samples from this population to be appropriate for testing rosetting as a potential mechanism of action. The median rosette frequency (percentage of iRBC that form rosettes) was significantly lower in P. falciparum isolates from malaria patients with one or more Sl2 alleles than in isolates from Sl1/Sl1 donors (Figure 7), whereas McC genotype had no significant associations with P. falciparum rosette frequency (Figure 7). The Sl2 allele is associated with reduced ex vivo rosette frequency of P. falciparum clinical isolates. Parasite isolates were collected from 167 malaria patients in Mali and matured in culture for 18–36 hr before assessment of rosette frequency (percentage of infected erythrocytes forming rosettes with two or more uninfected erythrocytes). Red bars show the median rosette frequency and interquartile range (IQR) for each genotype. (A) Rosetting by patient Sl genotype. Sl1/Sl1 (n = 22, median 20.0, IQR 8.3–36.5), Sl1/Sl2 (n = 82, median 4.0, IQR 0–20.3), Sl2/Sl2 (n = 63, median 5.0, IQR 0–17.0); *p<0.05, Kruskal Wallis with Dunn’s multiple comparison test; (B) Rosetting by McC genotype. McCa/McCa (n = 81, median 9.0, IQR 0–22.0), McCa/McCb (n = 73, median 6.0, IQR 0–20.0), McCb/McCb (n = 13, median 4.0, IQR 1–14.5); not significant, Kruskal Wallis with Dunn’s multiple comparison test. The data presented here provide epidemiological evidence supporting a role for CR1 in the pathogenesis of cerebral malaria. Two neighboring CR1 polymorphisms belonging to the Knops blood group system of antigens had opposing associations on risk of cerebral malaria. The Sl2/Sl2 genotype was associated with protection against cerebral malaria and death, while the McCb allele was associated with increased susceptibility (Figure 4 and Table 1). The Sl2 allele was also associated with significant protection against uncomplicated malaria, whereas the McCb allele was associated with borderline protection against several common infections in Kenyan children (Table 2). 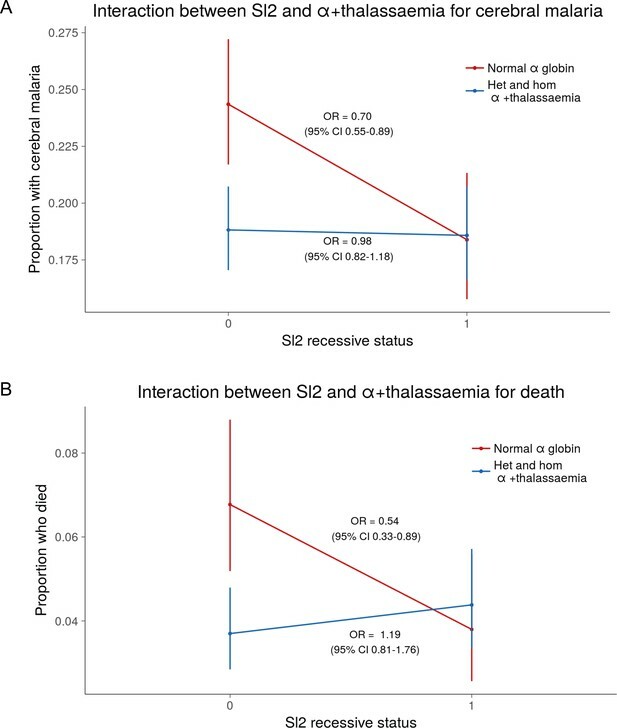 The protective association of Sl2 against cerebral malaria, death and uncomplicated malaria was influenced by α+thalassaemia, being most evident in children of normal α-globin genotype. The protective association between Sl2 and cerebral malaria was first reported in a small case-control study from western Kenya (Thathy et al., 2005), but has remained controversial, especially as most prior studies have been underpowered. Hence, our study is the first adequately powered independent sample set that replicates the protective association between Sl2 and cerebral malaria. Other studies found no consistent significant associations between Sl genotypes and severe malaria (Zimmerman et al., 2003; Hansson et al., 2013; Jallow et al., 2009; Manjurano et al., 2012; Toure et al., 2012; Rockett et al., 2014), including a recent multi-centre candidate gene study that included the sample set analysed here (Rockett et al., 2014). A weak association between McCb and an increased odds ratio for cerebral malaria was shown in the multi-centre study (Rockett et al., 2014). The complex interactions between Sl2, McCb and α+thalassaemia revealed by our study provide possible reasons for the previous inconsistent findings. Although Sl2 was associated with protection against cerebral malaria in our study, McCb and α+thalassaemia both counteracted this effect. The protective association of Sl2 was observed most clearly when both McCb and α+thalassaemia genotypes were included in the statistical model, something that has not been considered in previous studies. It is possible that some of the other discrepant genetic associations with severe malaria (Rockett et al., 2014) might result from interactions between multiple loci that vary across populations and may not be revealed by standard analyses. Biologically, it makes sense to account for McC genotype when investigating associations with Sl2 and vice versa, as the two polymorphisms encode changes only 11 amino acids apart in the CR1 molecule (Figure 1). The possibility that the observed association might be due to a haplotype rather than independent effects of Sl and Mc cannot be discounted. The interaction we describe here between Sl2 and α+thalassaemia is reminiscent of the epistatic interactions that have been observed between α+thalassaemia and other malaria-protective polymorphisms including sickle cell trait (HbAS) (Williams et al., 2005a) and haptoglobin (Atkinson et al., 2014). It is possible, therefore, that α+thalassaemia has a broad effect on multiple malaria-protective polymorphisms, influencing their restricted global frequencies (Penman et al., 2009), and contributing to the discrepant outcomes of previous association studies. Recent large genetic association studies on malaria do not include data on α+thalassaemia, because the causal deletions are not typed on automated platforms (Rockett et al., 2014), instead requiring manual genotyping using labour-intensive PCR-based methods (Chong et al., 2000). Replication of the Sl2/α+thalassaemia interaction will be required, and we suggest that α+thalassaemia genotype should be included as an important confounding variable in future malaria epidemiological studies and that efforts should continue to discover the mechanism of protection afforded by α+thalassaemia, which remains controversial (Carlson et al., 1994; Fowkes et al., 2008; Krause et al., 2012; Opi et al., 2014; Opi et al., 2016). We examined one possible biological mechanism by which the Sl2 allele might influence cerebral malaria by studying P. falciparum rosetting, a parasite virulence factor associated with severe malaria in African children (Doumbo et al., 2009). Previous in vitro experiments showed that CR1 is a receptor for P. falciparum rosetting on uninfected RBCs, and that RBCs serologically typed as negative for the Sl1 antigen (likely to be from donors with Sl1/Sl2 or Sl2/Sl2 genotypes) (Moulds et al., 2001) show reduced binding to the parasite rosetting ligand PfEMP1 (Rowe et al., 1997) . In this study, we found a significantly lower median rosette frequency in P. falciparum parasite isolates from Malian patients with Sl2 genotypes compared to Sl1/Sl1 controls (Figure 4). Therefore, similar to HbC (Fairhurst et al., 2005), blood group O (Rowe et al., 2007) and RBC CR1 deficiency (Cockburn et al., 2004), it is possible that reduced rosetting and subsequent reduced microvascular obstruction (Kaul et al., 1991) may in part explain the protective association of Sl2 against cerebral malaria. However, given the protective association of Sl2 with uncomplicated malaria, and the possible associations of Sl2 and McCb with other common childhood infections, it seems likely that the Knops polymorphisms may be associated with broader effects, for example on the complement regulatory functions of CR1. Previously, we have shown that neither cofactor activity for the breakdown of C3b and C4b nor binding to C1q are influenced by the Sl2 and McCb mutations (Tetteh-Quarcoo et al., 2012). In addition, we can find no association between Knops genotype and CR1 clustering on erythrocytes (Paccaud et al., 1988; Swann et al., 2017). However, other potential effects such as altered immune complex binding and processing or activation of the complement lectin pathway via mannose-binding lectin (Ghiran et al., 2000) have not yet been investigated. Our studies have several limitations: McCb homozygotes are relatively infrequent in Kenya, which limited our power to detect associations with McCb in the homozygous state. Our longitudinal cohort study generated several values of borderline statistical significance for the McCb allele which are inconclusive. Studies with larger sample sizes will be needed to examine the specific associations of McCb on assorted childhood diseases. Another limitation is that our functional (Mali) and epidemiological (Kenya) studies were conducted in different populations. The mechanisms of rosetting and associations with malaria severity are thought to be similar across sub-Saharan Africa (Rowe et al., 2009), suggesting that data collected in either location are likely to be comparable. Furthermore, examination of a small set of cerebral malaria cases and controls from Mali suggests a protective association between Sl2/Sl2 genotype and cerebral malaria also occurs in this setting (Appendix 1). Ideally, future epidemiological and functional studies of specific polymorphisms on malaria should be conducted within a single population, although this remains logistically challenging. In conclusion, we show that two high frequency CR1 polymorphisms have opposing associations with cerebral malaria and death in Kenyan children. While the Sl2 allele may have reached high frequency in African populations by conferring a protective advantage against cerebral malaria, our data suggest that McCb arose due to a survival advantage afforded against other non-malarial infections (Noumsi et al., 2011; Fitness et al., 2004). Sl2 may in part protect against cerebral malaria by reducing rosetting, but additional effects seem likely. Further work is needed to examine both the epidemiological effects of the Knops polymorphisms on diverse childhood diseases, and the biological effects of the Sl2 and McCb polymorphisms on CR1 function. Future epidemiological studies should account for the effect of α+thalassaemia on the associations between Sl2 and McCb on malaria and other infectious diseases. This study uses data from a Kenyan case-control study of severe malaria, with samples collected between 2001 and 2010, a Kenyan longitudinal cohort study, with samples collected between 1998 and 2001 and a Malian case-control study performed between July 2000 and December 2001. Historic datasets (i.e. >10 years old) are widely used in genetic epidemiological studies of malaria due to the logistical challenges of sample collection in malaria endemic countries and the changing epidemiological patterns of disease. All epidemiological and clinical studies in Kenya were carried out in the area defined by the Kilifi Health and Demographic Surveillance System (KHDSS), with Kilifi County Hospital (KCH) serving as the primary point of care (Scott et al., 2012). Malaria transmission is seasonal in this region following the long and short rains. An Entomological Inoculation Rate (EIR) of up to 50 infective bites per person per year was measured in the late 1990s (Mbogo et al., 2003), but transmission has since declined (O'Meara et al., 2008). Between January 2001 and January 2008, children aged <14 years who were admitted to KCH with severe malaria were recruited as cases, as described previously (Rockett et al., 2014), except that children who were resident outside the KHDSS were excluded (Figure 3). Severe malaria was defined as the presence of blood-film positive P. falciparum infection complicated by one or more of the following features: cerebral malaria (CM) (a Blantyre coma score (BCS) of <3) n = 943; severe malarial anaemia (SMA) (hemoglobin concentration of <5 g/dl) n = 483; respiratory distress (RD) (abnormally deep breathing) n = 522 or ‘other severe malaria’ (no CM, SMA or RD but other features including prostration (BCS 3 or 4), hypoglycemia and hyperparasitemia) n = 318. Controls (n = 3829) consisted of children 3–12 months of age who were born consecutively within the KHDSS study area between August 2006 and September 2010 and were recruited to an ongoing genetic cohort study (Williams et al., 2009). As such, controls were representative of the general population in terms of ethnicity and residence but not of age. The use of controls who are considerably younger than cases differs from the classical structure of a case-control study. However, this method (using cord blood or infant samples as controls) has been widely used in African genetic association studies (e.g. [Band et al., 2013; Busby et al., 2016; Clarke et al., 2017]) and is the most logistically feasible way of collecting sufficiently large numbers of control samples in many sub-Saharan African settings. The Sl and McC polymorphisms were originally typed as part of a larger study by Rockett et al., 2014, which included case-control data from 12 global sites. In Kenya, 0.5 ml blood samples were collected into EDTA tubes and DNA extracted using Qiagen DNeasy blood kits (Qiagen, Crawley, UK). DNA was stored at −20°C and shipped frozen to Oxford. Sample processing is described in detail in the supplementary methods of Rockett et al., 2014. Briefly, samples underwent a whole-genome amplification step using Primer-Extension Pre-Amplification. Genotyping was performed using SEQUENOM iPLEX Gold with 384 samples processed per chip. In Rockett et al.’s study, samples were typed for 73 SNPs; 55 of these SNPs were chosen on the basis of a known association with severe malaria, 3 SNPs were used to confirm gender and the remaining 15 SNPs to aid quality control. Samples were excluded if they did not have clinical data for gender or if genotypic gender of the sample did not match clinical gender. Samples were included if they were successfully genotyped for more than 90% of 65 ‘analysis’ SNPs. The Kenyan samples studied by Rockett et al. originally comprised 2741 cases of severe malaria and 4183 controls. After the quality control of both phenotypic and genotypic data described above, 2268 cases and 3949 controls were analysed by Rockett et al., 2014. Comparison between this study and Rockett et al., 2014. The 2268 Kenyan cases and 3949 controls that were analyzed by Rockett et al., 2014 were the starting point for our study. Children living outside the KHDSS were excluded, because this allowed us to use ‘location’ as a random effect in the final statistical model, which greatly improved model fit. Children with missing genotypes (Sl, McC, sickle cell, α+thalassaemia or ABO blood group) were also excluded (Figure 3). After applying these exclusion criteria, 1716 severe malaria cases and 3829 community controls were available for analysis. Hence, the number of severe malaria cases differs between our study and Rockett et al., 2014 due to differing exclusion criteria. The inclusion of the severe malaria cases who lived outside the KHDSS into our statistical models did not alter the findings of our analysis (Supplementary file 1K). In both our study and Rockett et al., 2014, the control samples were identical and all came from within the KHDSS. Our study has 120 fewer controls than Rockett et al., 2014 due to missing genotypes, because we only used controls for whom full Sl, McC, sickle cell genotype, α+thalassaemia genotype and ABO blood group data were available. Our analytical methods differed from Rockett et al., 2014, in that we included both Sl and McC in the same statistical model and adjusted for confounders, whereas Rockett et al. examined each SNP independently. This study has been described in detail previously (Nyakeriga et al., 2004). Briefly, this study was established with the aim of investigating the immuno-epidemiology of uncomplicated clinical malaria and other common childhood diseases in the northern part of the KHDSS study area, approximately 15 km from KCH (Williams et al., 2005b). The study was carried out between August 1998 and August 2001 involving children aged 0–10 years recruited either at the start of the study or at birth when born into study households during the study period. They were actively followed up on a once-weekly basis for both malaria and non-malaria related clinical events. In addition, on presentation with illnesses, cohort members were referred to a dedicated outpatient clinic for more detailed diagnostic tests. The cohort was monitored for the prevalence of asymptomatic P. falciparum infection through four cross-sectional surveys carried out in March, July and October 2000 and June 2001. Exclusion criteria included migration from the study area for more than 2 months, the withdrawal of consent and death. Uncomplicated clinical malaria was defined as fever (axillary temperature of > 37.5°C) in association with a P. falciparum positive slide at any density. The most common non-malaria-related clinical events reported during the study period included upper respiratory tract infections (URTIs), lower respiratory tract infections (LRTIs), gastroenteritis, helminth infections and skin infections, as defined in detail previously (Williams et al., 2005b). Malaria negative fever was defined as an axillary temperature of > 37.5°C in association with a slide negative for P. falciparum. This analysis includes 208 children aged < 10 years for whom full Sl, McC, sickle cell genotype, α+thalassaemia genotype and ABO blood group data were available. This study has been described in detail previously (Lyke et al., 2003). Briefly, between July 2000 and December 2001, children ranging from 1 month to 14 years of age were recruited into a case-control study in the Bandiagara region in East Central Mali, an area of intense and seasonal P. falciparum malaria infection. 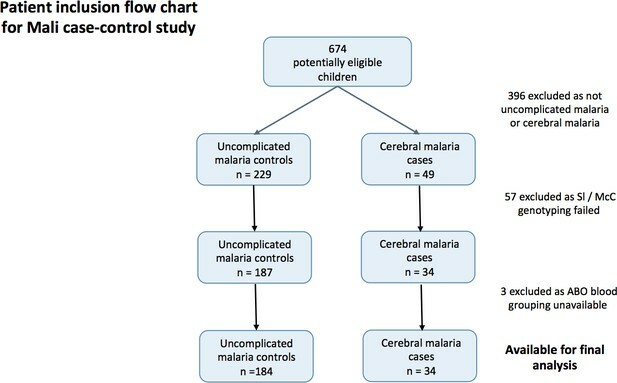 In order to address the specific question of whether the Sl2/Sl2 genotype is associated with protection against cerebral malaria in Mali, only the subset of children suffering strictly defined cerebral malaria (a BCS of <3, with other obvious causes of coma excluded, n = 34) or uncomplicated malaria (n = 184, symptomatic children with P. falciparum parasitemia and an axillary temperature ≥37.5°C, in the absence of other clear cause of fever), and for whom Sl and McC genotyping was available were analyzed. The rosette frequency (percentage of mature infected erythrocytes forming rosettes with two or more uninfected erythrocytes) of P. falciparum isolates from patients recruited into the Mali case-control study was determined by microscopy after short term culture (18–36 hr), as described in detail previously (Doumbo et al., 2009). Of the 209 isolates studied previously (Doumbo et al., 2009), 167 were successfully genotyped for the Sl and McC alleles and are analysed here. The rosetting assays were performed before we genotyped the study participants, excluding observer bias. The rosette frequency of parasites from hosts with differing Sl and McC genotypes were compared by a Kruskal-Wallis test with Dunn’s multiple comparisons (Prism v6.0, Graphpad Inc, San Diego, CA). DNA was extracted either from fresh or frozen whole blood by proprietary methods using either the semi-automated ABI PRISM 6100 Nucleic acid prep station (Applied Biosystems, Foster City, CA) or using QIAamp DNA Blood Mini Kits (Qiagen, West Sussex, UK). SNPs giving rise to the Sl and McC alleles were genotyped using either the SEQUENOM iPLEX Gold multiplex system (Agena Biosciences, Hamburg, Germany) (Kenyan study) (Rockett et al., 2014) or by an established PCR-RFLP method as described previously (Malian study) (Moulds et al., 2004). Genotyping for sickle cell trait (HbAS) and the common African α+thalassaemia variant caused by a 3.7 kb deletion in the HBA gene were performed by PCR as described in detail elsewhere (Chong et al., 2000; Waterfall and Cobb, 2001). The effects of the Sl and McC alleles were examined in genotypic, dominant, recessive and additive models of inheritance, with the best fitting model selected based on Akaike information criterion (AIC). Analyses for the Kilifi case-control study were performed in R (R Foundation for Statistical Computing, Vienna, Austria) (R Development Core Team, 2010) using the ‘ggplot2’, ‘lme4’, and ‘HardyWeinberg’ packages (Wickham, 2009; Bates et al., 2015; Graffelman and Camarena, 2008), while analyses for the longitudinal study were performed in Stata v11.2 (StataCorp, Texas, USA). In both studies, a p value of < 0.05 was considered statistically significant. Graphs were generated using R or Prism v6.0 (Graphpad Inc, San Diego, CA). For the Kenyan case-control study, Sl and McC genotype were included together in a statistical model to examine their associations with malaria susceptibility. Odds Ratios (ORs) and 95% Confidence Intervals (CI) were generated using mixed effect logistic regression analysis both with and without adjustment for ethnicity and location of residence as random effects, and sickle cell genotype, α+thalassaemia genotype, and ABO blood group (O or non-O) as fixed effects (variables which have been associated with malaria susceptibility in multiple previous studies in this population) (Jallow et al., 2009; Rockett et al., 2014; Williams et al., 2005a; Atkinson et al., 2014; Rowe et al., 2007; Williams et al., 2005b; Fry et al., 2008; Malaria Genomic Epidemiology Network et al., 2015). The ethnicity variable was compressed from 28 categories to four; Giriama (n = 2728), Chonyi (n = 1800), Kauma (n = 588) and other (n = 429). Binary parameterization of the α+thalassaemia variable was used, that is, comparing those children with no α+thalassaemia alleles against those with one or more α+thalassaemia alleles. This division was chosen in accordance with a previous report showing that both heterozygous and homozygous α+thalassaemia genotypes are associated with protection against severe malaria and death in the Kilifi area (Williams et al., 2005c). 2000 bootstrapped iterations were run to give 95% CIs and p values. For the Kenyan longitudinal cohort study, Incidence Rate Ratios (IRRs) and 95% CIs were generated using a random effects Poisson regression model that took into account within-person clustering. Data were examined with and without adjustment for confounding by McC genotype (for Sl analyses), Sl genotype (for McC analyses) sickle cell genotype, α+thalassaemia genotype, ABO blood group, ethnic group, season (defined as 3 monthly blocks), and age in months as a continuous variable. For the Malian case-control study, ORs and 95% CIs were computed using mixed effect logistic regression analysis with adjustment for location of residence as a random effect and age, ABO blood group (O or non-O) and ethnicity (Dogon or non-Dogon) as fixed effects. α+thalassaemia genotyping was not available for the Malian study and sickle cell trait is extremely uncommon in this population, therefore neither variable was included in the model. 2000 bootstrapped iterations were run to give adjusted ORs. Corrections for multiple comparisons were not performed, instead all adjusted odds ratios, confidence intervals and p values have been clearly reported. This approach has been repeatedly advocated, particularly when dealing with biological data (Rothman, 1990; Perneger, 1998; Nakagawa, 2004; Fiedler et al., 2012; Rothman, 2014). A detailed description of the Malian dataset is given in Appendix 1, and a detailed description of the statistical model fitting for the Kenyan studies is given in Appendix 2. To determine if the Mali case-control study was a suitable source of samples to examine the effect of Knops genotype on P. falciparum rosetting (Doumbo et al., 2009), we examined whether there was any evidence to suggest that the association of the Sl2/Sl2 genotype with cerebral malaria also occurred in Mali. 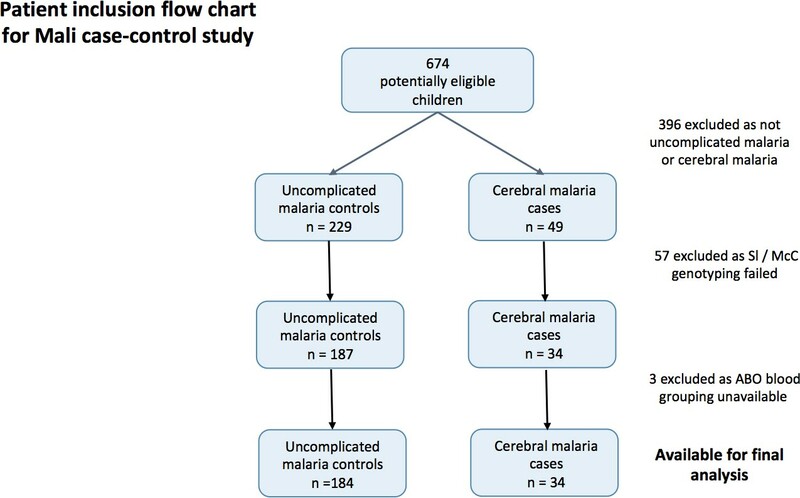 To do this, we examined the cerebral malaria cases (n = 34) and uncomplicated malaria controls (n = 184) from a case-control study (Appendix 1—figure 1) (Lyke et al., 2003). General characteristics of the cases and controls are shown in Appendix 1—table 1 and general characteristics by Sl and McC genotype are shown in Appendix 1—table 2 below. Patient inclusion flow-chart for the Mali case-control study. A mixed effect logistic regression analysis with adjustment for location of residence as a random effect and age, ABO blood group (O or non-O) and ethnicity (Dogon or non-Dogon) as fixed effects showed a protective association of the Sl2/Sl2 genotype (recessive model) against cerebral malaria (aOR 0.35, 95% CI 0.12–0.89, p=0.024). McCb (additive model) did not show a statistically significant association with increased odds of cerebral malaria (aOR 1.53, 95% CI 0.77–3.20, p=0.212). 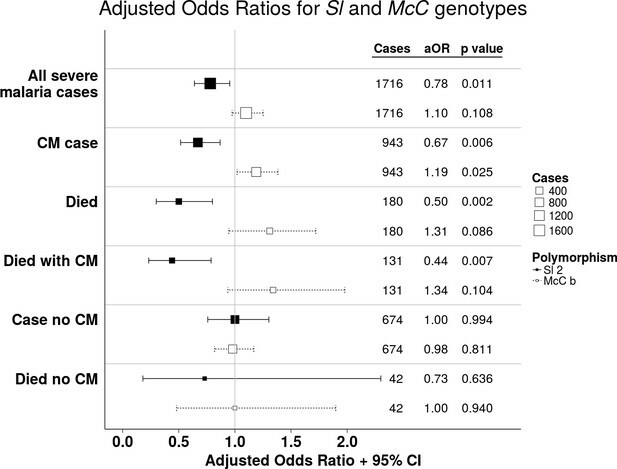 Sl2/Sl2-McCa/McCa was the only combined Sl/McC genotype to be significantly associated with protection (aOR 0.14, 95% CI 0.02–0.84, p=0.031). α+thalassaemia genotype data were not available for the Mali samples to test for interaction. Therefore, given that the data do suggest a protective association between Sl2/Sl2 genotype and cerebral malaria in Mali, we considered samples from this population to be appropriate for testing rosetting as a potential mechanism of action. General characteristics for cases and controls in the Mali case- control study. Table of Characteristics for the Malian dataset by Sl and McC genotype. CM, cerebral malaria; IQR, interquartile range. Significance testing uses uncomplicated malaria as the reference group. Age: Kruskal Wallis test. #: Fisher’s exact test. All other analyses: Pearson’s χ2. Analyses for the Kilifi case-control study were performed in R (R Foundation for Statistical Computing, Vienna, Austria) (R Development Core Team, 2010) using the ‘ggplot2’, ‘lme4’, and ‘HardyWeinberg’ packages (Wickham, 2009; Bates et al., 2015; Graffelman and Camarena, 2008). The dataset was restricted to children who were resident in the Kilifi Health and Demographic Surveillance System (KHDSS) (Scott et al., 2012) and had full genotyping data for Sl, McC α+thalassaemia, sickle cell and ABO blood group. This resulted in 1716 cases and 3829 controls (Figure 3). The ethnicity variable was compressed from 28 categories to four; Giriama (n = 2728), Chonyi (n = 1800), Kauma (n = 588) and other (n = 429). Binary parameterization of the α+thalassaemia variable was used, that is, comparing those children with no α+thalassaemia alleles against those with one or more α+thalassaemia alleles. This division was chosen in accordance with a previous report showing that both heterozygous and homozygous α+thalassaemia genotypes are associated with protection against severe malaria and death in the Kilifi area (Williams et al., 2005c). Variables associated with malaria susceptibility in multiple previous studies in this population (Jallow et al., 2009; Rockett et al., 2014; Williams et al., 2005a; Atkinson et al., 2014; Rowe et al., 2007; Williams et al., 2005b; Fry et al., 2008; Malaria Genomic Epidemiology Network et al., 2015) were included to give a ‘base model’. These variables were sickle cell genotype (as a binary variable, sickle trait vs no sickle trait), α+thalassaemia genotype (as a binary variable, one or more α+thalassaemia alleles vs no α+thalassaemia alleles) and ABO blood group (as a binary variable, group O vs non-group O). Both Sl and McC genotype were added in the simplest form (additive). All possible models for Sl were then examined (genotypic, dominant, recessive, heterozygous and additive models of inheritance, see Supplementary file 1L). Model selection was performed using a criterion-based approach by minimizing the Akaike information criterion (AIC) and discrimination (i.e. how well a model separates individuals with and without the outcome of interest) was determined using the c-statistic (area under the receiver operator curve). The recessive model had the best overall fit for Sl across clinical outcomes. The process of examining all genetic models of inheritance was then repeated for McC (Supplementary file 1M), with Sl as recessive included in each model. The additive model had the best overall fit for McC across clinical outcomes. All first order interactions were explored. The interaction with the greatest effect on the AIC was included in the final model. This resulted in an interaction term between Sl2 and α+thalassaemia being incorporated into the model. Finally, ethnicity and location of residence were incorporated as random effects in order to accommodate population structures which did not require quantification for this study. The final model incorporated ethnicity and location of residence as random effects, and as fixed effects had Sl2 in the recessive form (i.e. binary variable, Sl2/Sl2 vs Sl1/Sl1 or Sl1/Sl2); presence of at least one α+thalassaemia allele vs no α+thalassaemia alleles (binary variable);an interaction term between the Sl and α+thalassaemia variables; McCb in the additive form (i.e. impact of each additional McCb allele); presence/absence of sickle cell trait as a binary variable; O/non-O blood group as a binary variable. Bootstrapping was performed using the ‘bootMer’ function in package ‘lme4’ in R. 2000 iterations were run of each model to calculate 95% confidence intervals and p values. If models did not converge over these 2000 iterations they were inspected for singularities (i.e. a level of one of the variables having a value of 0, for example 0 cases living in Gede). If no singularities were identified, the bootstrapping was rerun using the optimiser ‘bobyqa’ with 105 evaluations. Corrections for multiple comparisons were not performed in this study, instead all adjusted odds ratios, confidence intervals and p values have been clearly reported. This approach has been repeatedly advocated, particularly when dealing with biological data (Rothman, 1990; Perneger, 1998; Nakagawa, 2004; Fiedler et al., 2012; Rothman, 2014). The stringency of multiple comparisons increases the risk of type II error, potentially discarding important findings. No single study can be considered conclusive and novel results will always require replication. As one of the four possible Sl/Mc haplotype combinations was not seen (Sl1/McCb), the Sl2 and McCb alleles are likely to be in complete linkage disequilibrium in this population sample (i.e. D’=1, no recombination between these two markers). This situation makes it difficult to distinguish statistically between a model where Sl and McC act independently and additively or a haplotype model. We considered the possibility that a haplotype model could provide an alternative explanation for our findings, with a separate true protective mutation being positively tagged by the Sl2 allele and negatively tagged by the McCb allele. Specifically, for each sample we computed the count of each of the three possible Sl/Mc haplotypes (assuming only three haplotypes are segregating as above). We then re-fit the logistic regression model for cerebral malaria using haplotype counts as predictors, in addition to potential confounders included in the full adjusted analysis described above. This model estimates a non-zero protective effect of the Sl2/McCa haplotype (additive OR = 0.85; 0.75–0.96; p=0.007), but did not fit as well as the full adjusted analysis described above (AIC = 4268.5, versus 4266.8 for the full analysis). As both Sl and Mc have sufficient structural effects to alter Knops blood group phenotype, it would appear reasonable to examine their function further before looking for other nearby mutations. In addition, no other strong effects near CR1 have been identified by GWAS studies that could explain the association. However, a haplotype model cannot be excluded as a possibility on the basis of our current data. Previous studies have described a negative epistatic interaction between sickle trait and α+thalassaemia, reporting that α+thalassaemia homozygotes who also carry the sickle trait are not protected from severe malaria (Williams et al., 2005a). We wanted to ensure that an unrecognised relationship between sickle cell trait and Sl genotype did not account for the interaction between α+thalassaemia and Sl that we report in the current study. Analysis of our current dataset confirmed the existence of negative epistasis between sickle trait and α+thalassaemia in this population (Supplementary file 1N). However, of interest, this negative epistatic interaction was only seen in the severe malaria cases without cerebral malaria, whereas the α+thalassaemia/Sl interaction was specific to cerebral malaria cases (Supplementary file 1N). Therefore, the two interactions appear to be mutually exclusive. The final adjusted analysis was also re-run on a restricted dataset which excluded the 664 children with sickle cell trait or sickle cell disease. The results of this analysis remained unchanged and the α+thalassaemia/Sl interaction persisted without any influence of sickle trait (Supplementary file 1O). 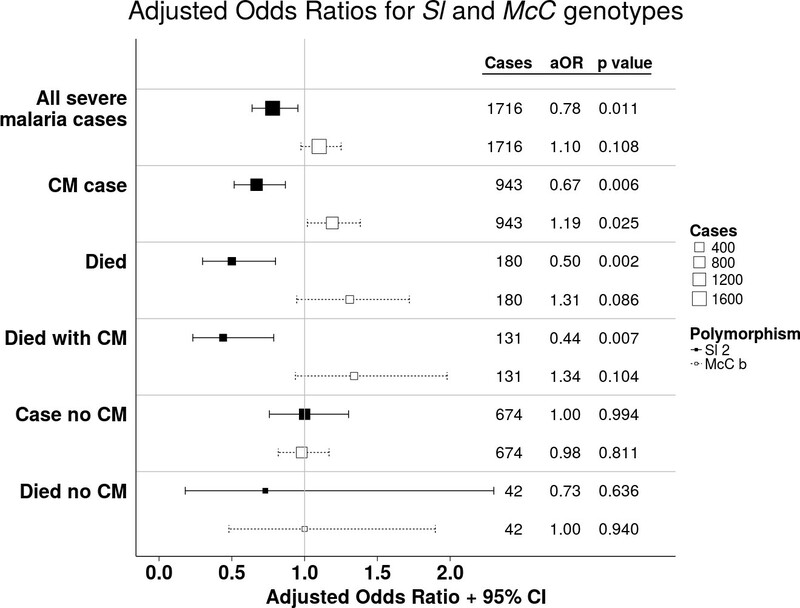 Sickle cell trait did not show a statistical interaction with either Sl or McC genotype. The sickle cell mutation is far less common in the KHDSS population than the α+thalassaemia mutation (~12% of children have one or more sickle cell alleles, compared to ~ 64% with one or more α+thalassaemia alleles). As such, even in a study as large as this one, the power to detect statistically significant interactions between all three of sickle, α+thalassaemia and Sl genotypes is greatly reduced. However, we found no evidence of a three way interaction between these alleles. The raw data for the combined genotypes compromising sickle trait, α+thalassaemia and Sl for each clinical outcome is presented in Supplementary file 1P. Correlations between sickle cell, α+thalassaemia, Sl and McC are presented in Supplementary file 1Q. Associations between Sl and McC and mild malaria and other non-malarial related diseases in the longitudinal cohort study were tested in Stata v11.2 (StataCorp, Texas, USA) using a random effects Poisson regression analysis that accounted for within-person clustering of events. This analysis was restricted to children under 10 years old living in the Ngerenya area in the northern part of the KHDSS study area. The analysis was carried out on the 208 children from the cohort with full genotype, ethnic group, season and age data. The model selection process first involved univariate analyses testing for disease associations for Sl and McC independently without potential confounders in genotypic, dominant, recessive, heterozygous and additive models of inheritance. Models were compared using the Akaike information criterion (AIC) for fitness, with the model displaying the minimum AIC values for each respective genotype and outcome of interest chosen as the best fitting model. The unadjusted Incident Rate Ratios and best fitting models are shown in Supplementary file 1J. For each disease outcome, the association with Sl genotype was then adjusted for confounding by McC (best genetic model chosen from the univariate analysis) and for explanatory variables previously associated with outcomes of interest: sickle cell genotype, α+thalassaemia genotype, ABO blood group genotype, ethnic group (Giriama, Chonyi and others), season (defined as 3 monthly blocks) and age in months as a continuous variable. AIC values were compared to identify the best fitting genetic model (Supplementary file 1R). The same process was carried out for the association of McC genotype with each disease outcome, with adjustment for Sl genotype and the other explanatory variables (Supplementary file 1S). For consistency of reporting here, the same explanatory variables are included in the statistical models for all disease outcomes in the data presented. Optimized model-fitting for each outcome by removing explanatory variables that did not improve model fit, did not make any material difference to the results shown here. Finally, we tested for interactions between either Sl and McC and α+thalassaemia (represented as normal, heterozygous and homozygous genotypes) using the likelihood ratio test with a p value of <0.05 indicating statistically significant evidence for interaction, and the appropriate interaction term included in the final model. American Journal of Tropical Medicine and Hygiene 81:987–993. Perspectives on Psychological Science : A Journal of the Association for Psychological Science 7:661–669. The American Journal of Tropical Medicine and Hygiene 71:330–340. Journal of Vector Borne Diseases 46:288–294. The Journal of Experimental Medicine 192:1797–1808. Trends in Molecular Medicine 8:531–537. The American Journal of Tropical Medicine and Hygiene 69:253–259. The American Journal of Clinical Nutrition 80:1604–1610. Journal of General Internal Medicine 29:1060–1064. Expert Reviews in Molecular Medicine 11:e16. The Journal of Immunology 165:6341–6346. International Journal of Epidemiology 41:650–657. Pathogens and Global Health 109:247–252. The Journal of Infectious Diseases 192:178–186. Thank you for submitting your article "Two complement receptor one alleles have opposing associations with cerebral malaria and interact with α+thalassaemia" for consideration by eLife. Your article has been favorably evaluated by Prabhat Jha (Senior Editor) and three reviewers, one of whom, Madhukar Pai (Reviewer #1), is a member of our Board of Reviewing Editors. The reviewers have discussed the reviews with one another and the Reviewing Editor has drafted this letter to draw your attention to significant concerns that you would need to address before this work could be considered for publication. This is an interesting but complex study with different study designs, looking at interactions between 3 mutations and malaria. The study raises hypotheses that will need to be confirmed in future studies. The study evaluated the relationship between 2 SNPs (rs17047661 and rs17047660) of CR1 and several malaria phenotype (cerebral malaria, death, uncomplicated malaria other severe forms of malaria) as well as non-malarial disease. The authors found that 1) the Sl2/Sl2 genotype is associated with protection against cerebral malaria and death, p=0.006 and p= 0.002 respectively, 2) the McCb allele is associated with increased susceptibility to cerebral malaria and death, p=0.008 and p=0.046 respectively, 3) the Sl2/Sl2 genotype was associated with protection against uncomplicated malaria p<0.001, and 4) the McCb allele was associated with protection from non-malarial disease p=0.02. Finally, the authors demonstrated that the allele Sl2 was associated with reduced ex vivo rosette frequency, whereas McC had no significant effect on P. falciparum rosette frequency. The paper is interesting and suggests the role of CR1 polymorphisms in susceptibility/resistance to malaria and non-malarial disease. However, the reviewers have major concerns on several points. 1) Given the dramatic reductions in severe malaria and deaths in the past decade, it is a bit strange that the studies were done with data collected during 2001-08 (case control study), and 1998-2001 (cohort study). So, a decade later, the authors have gone back to analyze stored samples. The implications of this are not clear and need to be clearly addressed. Are there time trends that can confound the associations? What about use of old samples and sample quality? Were the hypotheses pre-stated or generated post-hoc? (presumably the latter). 2) As regards the case-control study, I would need more convincing that cases and controls were derived from the same study base. The difference in age distribution will likely not matter for the genetic mutations, but what about implications for disease severity? 3) The authors indicated that the study included 5545 children from Kenya consisting in 1716 severe malaria cases and 3829 community controls.a) The authors performed the analysis on a subset of the samples used previously by Rockett et al. (2014). The authors should clarify why they did not use the total sample set of 2268 severe malaria cases included in Rockett et al. and how the 1716 samples were selected. b) As indicated by the authors, 407 individuals are excluded as lived out with KHDSS (Figure 3). Why? The authors should clarify this point. DNA not available? It would be surprising because all CR1 genotype (rs17047661 and rs17047660), sickle cell genotype, a+thalassaemia genotype and ABO blood group were available in the previous study of Rockett for the Kenyan population. c) It is not clear for me whether new genotyping has been performed for this study or if they re-used the genotypes obtained in the Rockett's study. d) Why did the authors use controls recruited to an ongoing genetic cohort that were representative of the general population (Williams et al., 2009) as indicated in the subsection “The Kilifi case-control study” rather than used the controls of the previous study (Rockett et al.) that were also representative of the general populations? Is there a scientific reason? Are the Rockett controls not relevant? It would be interesting if the authors performed statistical analysis with the Rockett controls to confirm the results. e) According to the sample size even if the p-value was lower than 0.05 and due to multiple-testing, the statistical results indicated only suggestive associations. As the p-value is borderline, these findings need to be replicated in an independent sample set to be convincing. f) In the Discussion, the authors indicated that no significant association was seen with CR1 polymorphisms in the multi-centre candidate gene study (Rockett et al. ), but the cases of the present study come from the Rockett's study and were compared to another control group. This information is confusing. It would be very important to confirm the association by using the Kenya controls from the Rockett's study to exclude potential selection bias in the control group. To perform this analysis, the authors should also take into account the complex interactions between Sl2, McCb and α+thalassaemia detected in the present study. 4) This reviewer's primary struggle with this paper is that it does not fully address how the known interaction between α-thalassemia and Sickle may be influencing or overlapping with these results. As the raw data are not included in the supplementary for these loci, the reader is forced to interpret these results with only the models and genotype frequencies that the authors have presented. This work uses substantially larger populations with better exposure controls than past reports on this topic, and thus after addressing several concerns, this work will be a valuable contribution to the community. 5) What is the population breakdown for the combined genotype that includes α-thalassemia, Sickle, Sl, and Mc together in each patient? Ideally this would also be broken down by disease outcome as well. 6) The binary parameterization of α-thalassemia described in Appendix 1 subsection “The Sl2/Sl2 genotype is associated with protection against cerebral malaria in Mali” would appear to be miss-specified in light of Williams, 2005. It would seem more appropriate to model the double deletion vs. single or normal; or perhaps better in the early models to allow all three categories to compete for Sickle and Swain interactions. During model building the α-thalassemia-Sickle interaction may have been missed because of this, and it makes it difficult to determine whether the α-thalassemia-SL interaction is independent. Although the main effect term for Sickle is included in downstream adjusted models, there is not enough information to assess whether this factor would account for the α-thalassemia-Sickle interaction. 7) Cerebral malaria numbers are reported for the Mali cohort in Supplementary file 2, however associations with Knops are not discussed. It appears that these numbers may conflict with the trends in Kenya, and yet rosetting is still tested against these genotypes and presented as a potential mechanism of protection. Please reconcile this section or consider limiting the mechanistic connection to citing Rowe, et al. All the samples used were of high quality and underwent stringent quality control. The “Sample processing and quality control for the Kenyan case-control study” section in the Materials and methods has been expanded to cover the quality control steps employed in sample collection and genotyping. The hypotheses addressed in this study were generated after collection of the specimens, but prior to any exploratory analysis of the relevant datasets. The cases and controls studied here were all derived from exactly the same area, which is the geographic region defined by the Kilifi Health and Demographic Surveillance System (KHDSS) (Scott et al., 2012). This is described in the Materials and methods, subsection “The Kenyan study area”, and a precise description of the cases and controls is described in an expanded section in the Materials and methods, subsection “The Kenyan case-control study”. The controls were infant samples that were used to estimate the relevant genotype frequencies in the population from which the cases arose. This method has been widely used in African genetic association studies (e.g. Clarke et al., 2017; Busby et al., 2016; Band et al., 2013; Rockett et al., 2014) and is supported by general commentators (e.g. Rothman, 2014 and Vandenbroucke et al. International Journal of Epidemiology 2012). This is currently the most logistically feasible way of collecting sufficiently large numbers of control samples in many sub-Saharan African settings. Text describing the rationale for using infant control samples has been added to the Materials and methods, subsection “The Kenyan case-control study”. 3) The authors indicated that the study included 5545 children from Kenya consisting in 1716 severe malaria cases and 3829 community controls. a) The authors performed the analysis on a subset of the samples used previously by Rockett et al. (2014). The authors should clarify why they did not use the total sample set of 2268 severe malaria cases included in Rockett et al. and how the 1716 samples were selected. We apologise for the confusion caused by the lack of detail on how our study design differs from Rockett et al. The differences between our study and Rockett et al. is now fully explained in the “Comparison between this study and Rockett et al.” section in the Materials and methods (also Figure 3). See also the comments below. We excluded the severe malaria cases from outside the KHDSS because all of the controls came from within the KHDSS. Using only cases and controls from exactly the same area allowed the use of location as a random effect in the final statistical model, which greatly improved model fit. This is now described in the “Comparison between this study and Rockett et al.” section in the Materials and methods. We have repeated our analysis including the severe cases of subjects who lived outside of the KHDSS study area (Supplementary file 1K), and this gives the same overall result as that shown in the main text. This is stated in the Materials and methods subsection “Comparison between this study and Rockett et al. (Rockett et al., 2014)”. The only additional genotyping of the Kenyan samples that was done for our study was for sickle cell trait and α +thalassaemia, as described in the Materials and methods, subsection “Laboratory procedures”. We agree that there is evidence, but not unequivocal evidence, for the suggested associations. The protective association between Sl2 and cerebral malaria was first reported in a small case- control study from western Kenya (Thathy et al., 2005), but most subsequent studies have been underpowered. Our study is thus the first adequately powered independent sample set that replicates the protective association between Sl2 and cerebral malaria. Furthermore, our study shows for the first time that McCb and α+thalassaemia influence the protective association of Sl2 on cerebral malaria risk. Hence, our study contributes significantly to this debate and provides novel insights that may explain previous conflicting findings on CR1 polymorphisms and malaria. We agree that further replication of our novel findings will be required. Unfortunately, because α+thalassaemia results from a deletion mutation, not a SNP, it cannot be detected on classical SNP-genotyping platforms, and has to be performed manually using labour intensive PCR-based methods (Chong et al., 2000), as in our study. The attempts of our collaborators in the MalariaGen consortium to impute α+thalassaemia genotypes from existing SNP genotyping data have not yet been successful. Hence, currently, to our knowledge, there are no other large sub-Saharan case-control studies that are typed for α+thalassaemia and Sl and McC polymorphisms that could be used for replication. Future work will address this need, but this is beyond the scope of the current manuscript, which is already complex, incorporating as it does results from two different epidemiological studies and functional data. We have added text discussing the important issues of replication in the second and fourth paragraphs of the Discussion. As stated in response to 3d above, the controls used in our study are the same as the controls used in Rockett’s study. As explained in response to 3a and 3b above, our study excludes some of the cases included by Rockett et al., due to their residence outside of the KHDSS. However, re-analysis including the additional cases studied by Rockett et al. (Supplementary file 1K) returns the same results as those shown in our main text. In other words, the difference in inclusion criteria does not explain why our results differ from Rockett. i) We include Sl and McC in the same statistical model and adjust for confounding factors, including the statistically significant interaction with α+thalassaemia, whereas Rockett et al. looked at each SNP in isolation. This is now stated in the Materials and methods, subsection “Comparison between this study and Rockett et al. (Rockett et al., 2014)”, last paragraph. The rationale for examining the effects of Sl and McC together in the same statistical model is that the two SNPs are only 33 bp apart in the CR1 gene, and each causes a change in amino acid charge (Sl: rs17047661 R1601G and McC: rs17047660 K1590E) with potential to impact upon the structure and function of the CR1 protein. Hence, it is biologically plausible that Sl might influence McC and vice versa. ii) We are examining data from a single region in Kenya, whereas Rockett et al. analysed pooled data from 12 global sites. They state in their paper “…it is undoubtedly also the case that authentic genetic associations might be missed in multicentre studies if there is heterogeneity of effect across different study sites”. Given that our data suggest that McCb and α+thalassaemia influence the protective association of Sl2 with cerebral malaria, and that the frequencies of McCb (Figure 2) and α+thalassaemia are known to vary geographically, it would be predicted that the association of Sl2 with cerebral malaria will vary by location, and may be missed by pooling data across different study sites. We have summarised these arguments in the third and fourth paragraphs of the Discussion. The potential effect of the α-thalassemia/sickle interaction on our results is answered in detail in a new section “Exploration of the negative epistasis between sickle trait and α+thalassaemia” in Appendix 2, and in new tables (Supplementary file 1N, 1O and 1P). See also comments below. We have added data for the combined genotypes compromising sickle trait, α+thalassaemia and Sl for each clinical outcome in Supplementary file 1P. The parameterization of α+thalassaemia used in our model i.e. 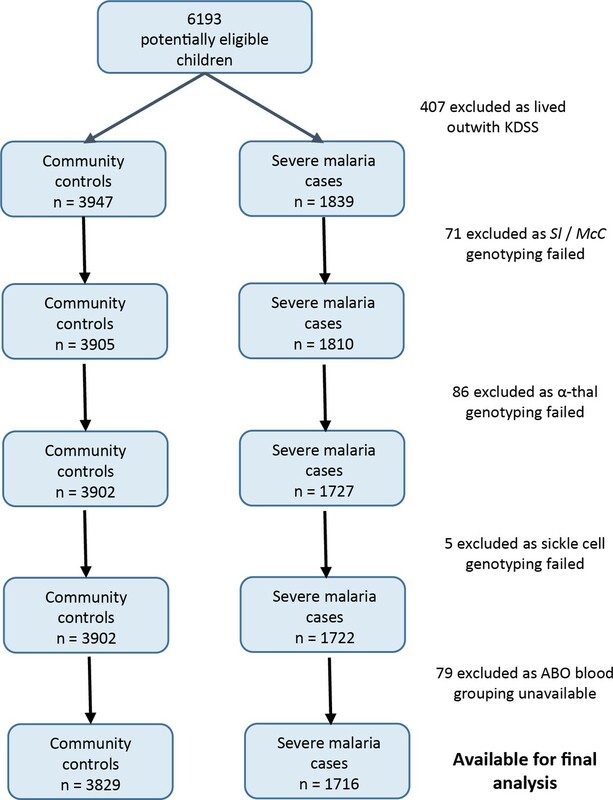 no α+thalassaemia alleles (normal) vs. one or more α+thalassaemia alleles was chosen in accordance with a previous report showing that both heterozygous (single deletion) and homozygous (double deletion) α+thalassaemia genotypes are associated with protection against severe malaria and death in the Kilifi area (Williams, Wambua, et al., 2005). A description of the parameterization of theα+thalassaemia variable can now be found in the Materials and methods, subsection “Statistical analysis”, second paragraph. Investigation of interaction between sickle trait and α+thalassaemia is now described in the “Exploration of the negative epistasis between sickle trait and α+thalassaemia” section in Appendix 2. Analysis of our dataset confirms the existence of negative epistasis between sickle trait and α+thalassaemia in this population (Supplementary file 1N). However, of interest, this negative epistatic interaction was only seen in the severe malaria cases without cerebral malaria, whereas the α+thalassaemia/Sl interaction was specific to cerebral malaria cases. Therefore, the two interactions appear to be mutually exclusive. Therefore, we can confirm that for cerebral malaria in this dataset, no significant interaction exists between sickle trait and α+thalassaemia. This is the case no matter which α+thalassaemia parameterisation is used. There is no conflict between the Mali and Kenya data. A protective association between the Sl2/Sl2 genotype and cerebral malaria was identified on analysis of the Mali dataset (aOR 0.35, 95% CI 0.12-0.89, p=0.024) and the Sl2/Sl2-McCa/McCa genotype combination was associated with protection against cerebral malaria (aOR 0.14, 95% CI 0.02-0.84, p=0.031). As such, we considered blood samples from this population to be appropriate for testing rosetting as a potential mechanism of action. To make this clearer we have now included a sentence describing the protective association between Sl2 and cerebral malaria in the Mali case-control to the Results, subsection “The Sl2 allele was associated with reduced ex vivo rosette frequency in P. falciparum clinical isolates from Mali”. We thank Johnstone Makale, Metrine Tendwa and Emily Nyatichi for laboratory support and all staff involved with data and sample collection at the Kilifi County Hospital, the KEMRI-Wellcome Trust Research Programme, Kilifi, Kenya and the Bandiagara Malaria Project Team, Bandiagara, Mali. We also thank the study participants and their parents for consenting to this study. This paper was published with permission from the Director of the Kenya Medical Research Institute (KEMRI). Human subjects: This work involved analysing blood samples from patients with malaria and from healthy controls. Written informed consent was obtained from the parents or legal guardians of all participants. The studies received ethical approval from the Kenya Medical Research Institute National Ethical Review Committee (case control study: SCC1192; cohort study: SCC3149), the University of Bamako/Mali Faculty of Medicine, Pharmacy and Dentistry Institutional Review Board (which, at the time the study was accepted did not give out approval numbers) and the University of Maryland (approval number #0899139). © 2018, Opi et al.